Yuri Herrera (Actopan – Mexico, 1970) studied Politics in México DF, Creative Writing in El Paso and took his PhD in literature in Berkeley. His first novel to appear in English, Signs Preceding the End of the World, was published to great critical acclaim in 2015 and included in many Best-of-Year lists, including The Guardian’s Best Fiction and NBC New’s Ten Great Latino Books. He is currently teaching at the University of Tulane, in New Orleans. 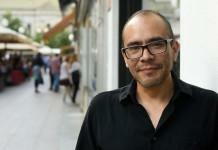 His three novels, a kind of modern Mexican trilogy, are translated into more then ten languages.